I don't know what it is about this summer, but things keep happening that remind me of summers when I was a kid. Last week I attended an NWC Foundation Women's Giving Circle event where faculty members John Giarrizzo and Burt Bradley gave us a taste of their Art and Writing in the Wild course. The class brought back fond memories of my childhood sitting outside in the grass looking at the clouds. As part of our Computer Services Department's maintenance work this summer, this blast from summers past was recently discovered. 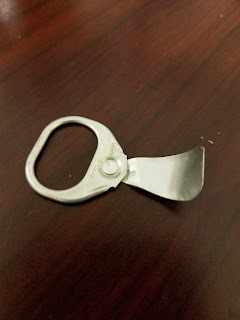 The summer when I was 8, I blew out my flip flop AND stepped on a pop top. This was before I had even heard of Jimmy Buffet, but his music always takes me back to summers past. Here's to summer's frozen concoctions and great memories.